1010 & 1020 15.25" Diameter Roof Drain & Low Profile Dome - Jay R. Smith MFG Co.
Used in flat roof of any construction. 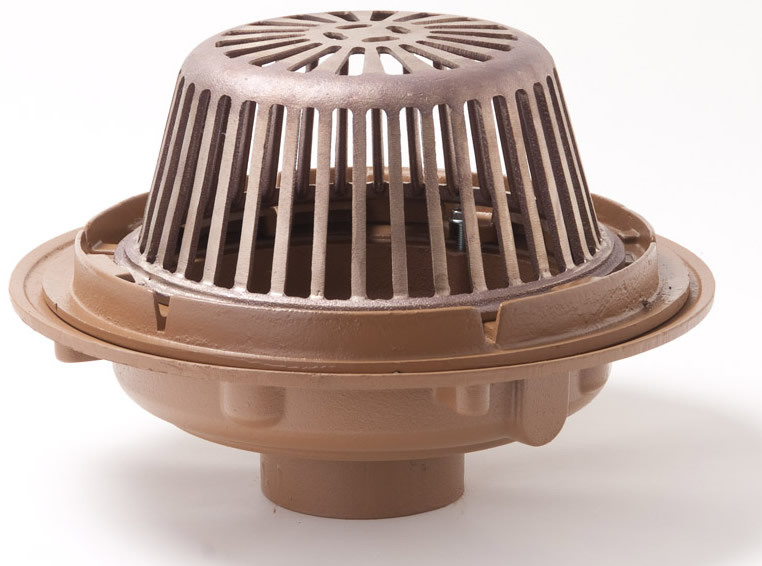 Large low profile dome provides sufficient free area for quick drainage of rain water and protects the drain sump and connected piping from the intrusion of debris. Wide clamping surface holds flashing and roofing materials without puncturing. Time, budget, and safety are important considerations in every job. Smith’s Roof Drain and Overflow Drain with Deck Plate can help with all three. The drain eliminates the need for underdeck clamps and is mounted directly to the top deck, so it can be installed by a single person. Because you no longer need a second installer on the floor below, you remove potential safety hazards associated with climbing and save on installation time. Saving time and labor leads to monetary savings that will help your budget. Speed of installation. Roof drains can be pre-assembled to deck plate and placed as one unit from the top roof surface, saving time. Secure Installation. Large Roof Deck Plate is easy to install using fasteners from the top of roof only. No underdeck clamp required means less hardware and time savings. Installation from above means less time on ladders or lifts and less overhead work. The only task after installation is the actual pipe connection, made to a secured assembly. Reliability. The drains are installed in a recess to prevent a water dam. Simplicity. Roof penetrations are square, not round, saving time. Eliminate any risk of leakage at your gasket seals by taking those seals out of the equation. This top mounted drain elevator, as the name suggests, lifts the drain out of the waterway. The only seal requiredis where the roof waterproofing material is flashed into the drain. Smith No. 1010 cast iron roof drains with flashing clamp and polyethylene dome. Furnish extension suffix (-E) for insulated roofs.Sump receiver suffix (-R) and underdeck clamp suffix (-C) for all but poured-in-place installations.Specify vandal proof dome suffix (-U) when required. Ferrous domes not acceptable. Smith No. 1010 (-E-R-C) cast iron body with flashing collar, extension for insulation, underdeck clamp, sump receiver and polyethylene dome. Smith No. 1020 (-E-R-C) for side outlet. Smith No. 1010 cast iron body with flashing clamp and polyethylene dome. Smith No. 1010 (-R-C) cast iron body with flashing clamp underdeck clamp, sump receiver and polyethylene dome. See manufacturer’s catalog for recommended deck opening. Smith No. 1020 (-R-C). Smith No. 1010 (-R-C) cast iron body with flashing clamp, underdeck clamp, sump receiver and polyethylene dome. See manufacturer’s catalog for recommended deck opening.Smith No. 1020 (-R-C) for side outlet.